Regardless of where you land on the debate regarding the ELD mandate or its merits, the reality is that the time for implementation has arrived and transportation and logistics professionals must adhere to these new measures. As you all know, the efforts made to delay or halt the decision on ELD’s were ultimately unsuccessful, and the smartest thing anyone in the industry can do at this point is to be knowledgeable about the new regulations and be prepared for the effects its implementation will have on us all. With those points in mind, we’re going to break it up into three small sections and provide insights on how this mandate will impact third party logistics providers, Drivers, and the supply chain as a whole. First, lets discuss the effect that the new regulations will have on third party logistics providers like AGT. ● In order to play a part in proper use of Hours Of Service (HOS), 3PL’s will need to work with carriers to properly schedule and communicate the pickup and delivery schedule to the shippers and receivers. ● As productivity will decrease, 450-600 mile one day trips will result in 2 day trips and 900-1200 mile 2 day trips will likely become 3 day trips – as a result rates will increase. ● AGT plans on strategically working with carriers of various fleet sizes and markets to mitigate the effects of the ELD mandate on shippers & 3PL’s. This is where the rubber literally hits the road, and our drivers will certainly feel this mandate the heaviest out of all parties involved. 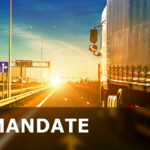 ● Though the intended impact of the ELD Mandate is to increase the safety of drivers by reducing “driver fatigue,” many still face the daunting decision of whether to comply or cease operations altogether. ● There will be many drivers who have been moving shipments with accelerated transit who will now be forced to operate according to legal hours. This will impact the frequency with which a truck is available for use and change how long it takes some shipments to deliver. ● With these new hours restrictions, it is important for carriers to work with shippers and 3PL’s to make sure loads are ready and driver selection is based on best HOS for that specific trip. Lastly, let’s finish by pointing out what this new mandate will do to the overall supply chain. Communication between all parties will be critical to the efficiency of supply chains. HOS will become a hot commodity and will need to be maximized. Rate increases are also likely to impact shippers/receivers who have slow loading or unloading times. This is something that can’t be overlooked. Shippers and receivers need to be prepared with resources to load & unload shipments. ● Shippers that are prepared with resources to load, all necessary paperwork completed and an accurate time for loading will prevent delays resulting in less wasted drivers HOS. ● In that same respect, if the receiver is also prepared, the driver can promptly unload the freight, possibly reserving HOS for the next shipment and allowing for more capacity to other shippers and/or 3PL’s. ● Delays in loading and unloading could now be more costly than ever before. While the ELD mandate is not “the end of the world” it does create a number of new pitfalls and considerations that need to be navigated carefully if your company is going to thrive in the new logistics landscape – particularly if you own/operate/manage a smaller fleet. We hope this information was helpful. Please feel free to contact us with any questions you may have.